I lost Robin, Robin lost me. Today, rather comical situations : I lost Robin, Robin and lost me. 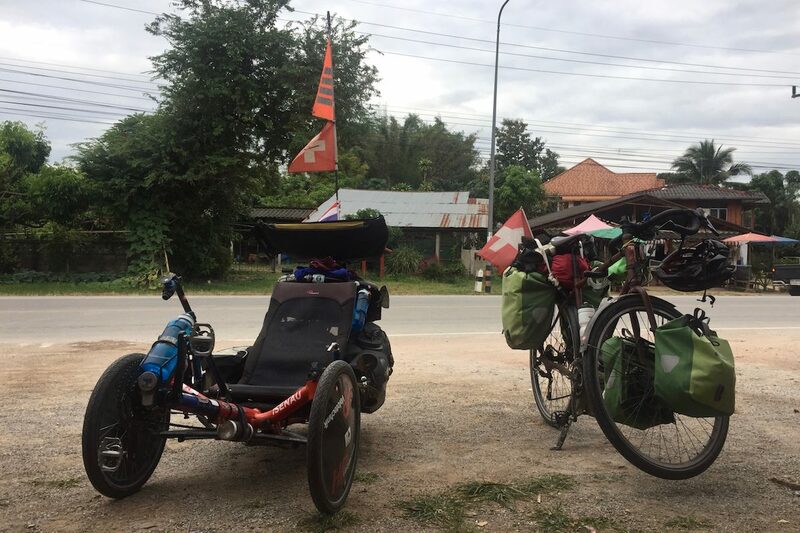 In normal times, when the altitude is highly variable as is the case for several days, Unlike rhythms between the bike and trike is widely felt. The consequence is that each rise, I find myself quickly ahead, unable to pedal slowly enough without falling, trying to find my most enjoyable pace. In general, I stopped at the top of each collar to wait my buddies, which then will fade away before during descent, favored by a much more stable mount my bike, and at much lower center of gravity. Just then a slight rise or false flat for me to catch up in less than two aero position with my road bike handlebars. I exceeded the rise after, and the loop begins again. It's a real rhythmic yo-yo. so today, this accordion effect will have been due to us. After a short break snack / pee on top of a hill, Robin loose his brakes to begin the descent. Busy store the banana regime which we have just started a good half, I watch it disappear behind the road surface, to throw myself at his heels a minute later. Knowing faster than me downhill, I'm not surprised not to see him down the neck. I have only to catch up ! The road is slightly uphill, I decided to go quiet. The difference in rates will do the rest ! 15 minutes pass, a half hour, then an hour… No trace of Robin. But what it takes to him ? Ok, I know he just needs to swing a little Drum&Bass on the portable stereo housed in the back of his trike to suddenly have a fallen power of nowhere and gain significantly speed, but still… He abuses a little there, non ? Knowing that I'm not fast enough to catch up, I choose to change music playlist and play something more motivating than the complaints of Jacques Brel who accompanied me this morning, I cling to my handlebars and I accelerate the pace. 15 minutes later, still not the least for Robin… But what fly stung ? Is it about to try to catch me, having forgotten that for once, is me following behind ? Or maybe it's me who got crazy ? I have only a head certainty : I did not see the edge of the road. If he was in front of me at checkout, then it can not be otherwise now, unless… Could have taken a wrong turn ? There has been a branch at one time, but how could he take the road engaging in a direction completely opposite to that we must take ? It has a GPS, it makes no sense… Could he have done off the road in the downhill and end up in the ditch adjacent to the road, which would have made invisible from the road ? At the moment, everything is mixed in my head, and I'm not sure of anything. I come even to doubt the fact that he left before me, while there is still 10 minutes, I was absolutely convinced. 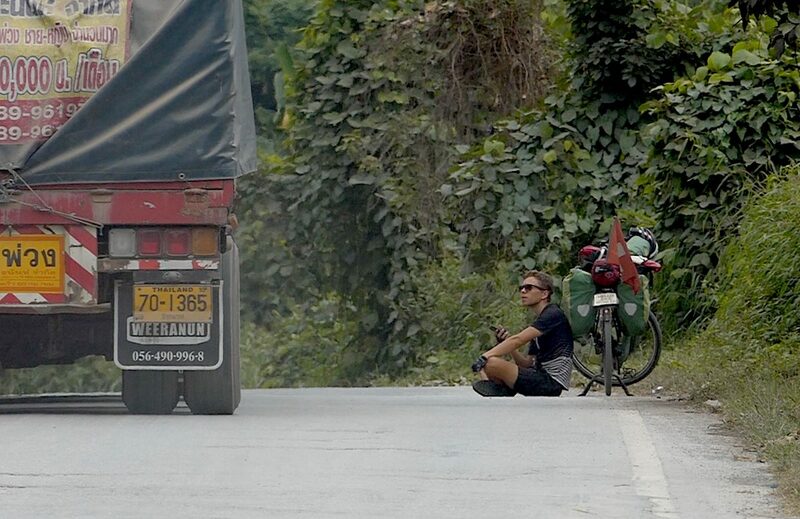 In doubt, assuming that I am crazy and has well been behind me, I decide to stop at the roadside and wait. I sit comfortably and I start to work in the shade of a tree. After half an hour, the evidence seems to be emerging : it is not behind. But how on earth could it be before, without having swallowed three kilograms of vitamins ? I leave then, empty-handed, not too sure whether I have to drive fast to catch up or slowly to the catch up. Unable to communicate clearly, Laos is far Keen'V internet that is good musical taste. I begin to wonder if there really is not anything happened to my friend, and that I should not be missed without realizing it. In any case, if he had stopped, he would have remained visible in the road and would have seen me arrive, then how ? Why ? « I lost my friend, who is riding a strange three-wheel bicycle, did you see him ? Yes ! We saw him ! Italian replies, obviously very happy to help me. Great ! So is he in front of me or behind me ? A desire to laugh then seizes me. decidedly, this trip will have reserved some surprises me… A week ago, Arlen has left us to get ahead and find his girlfriend in Luang Prabang, have Laos. 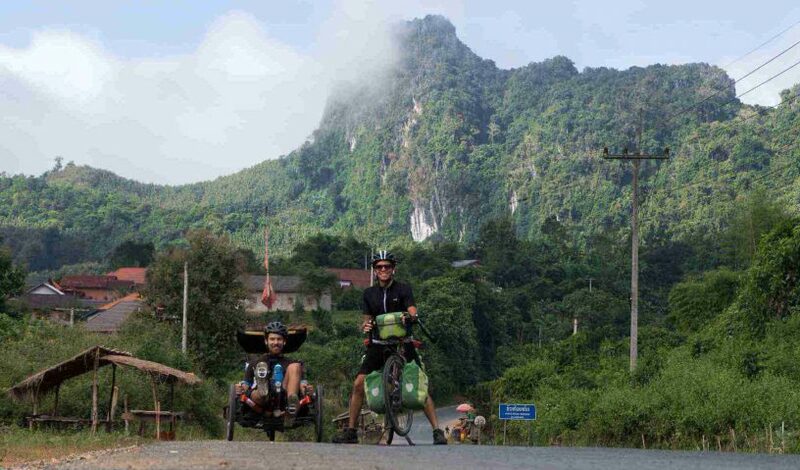 And three days ago, these Italian tourists fell on him, on the Thai border… It makes what, it, as probability ? Suddenly a woman, who obviously followed the conversation, s’avance. I do not know if I should be surprised or not. I must have missed an episode, the sun had hit a little hard on my head, today. After having thanked those friendly tourists, I sit at a small table, coffee before me. I'll wait. He too must be a little shaken by so many mysteries. As expected, I alerted after an hour of laughter and cries of children : Robin appears at the entrance of the village. He sees me, slows and comes to put next to me, shaking his head with amusement and simultaneously doubtful. "This is where we screwed up ? I said, getting up. Happy to see you again, Robin ! I understood nothing, He then begins. The same, haha ! After that will be lost to, when I was in front – I then reassure myself by saying I was not crazy ! -, I rode one minute or two, and I stopped to buy a cold tea, right on the floor. I have not left the road ahead, unless maybe 5 seconds, time to choose my drink in the fridge. I then sat at the table and I waited, expected, expected. After fifteen minutes, I told myself : that's it, he still managed to croak ! Then, Seeing you really not get, I say you should need help. So I went back up the hill where we had left. And… I got up. Without seeing you. I thought I had gone mad, how is it that I have missed you ? It's really crazy. And how do I, I have missed you ? So I wound, continue Robin, and I rolled, rolled. I thought you had to be in front, spirited run at full speed to catch me, because you believed me before you. And that's when I asked myself if I had not missed you, embedded in a clod of earth at the bottom of a ditch… To have the heart net, I stopped a, two, three cars, and I showed them your picture. It's here, seeing their air glad and frantic nod, I understand you were before. So I drove carefully, knowing that I could not catch you while driving, since you too, I was catching you. It was the endless loop, in fact. And there you, now ! We celebrate our reunion with a small banana – oh, how original ! – and we hit the road together, pinions. sacred history, still ! All these scenarios that we trotted in the head, to him as to me, and those truths which fell one after the other, who managed to make me doubt my own sanity. One unknown stand forever in this story: how is it possible that we we are duds, while Robin was waiting scrutinizing eyes on the road, and I tend, for my part, rolling eyes open to see where I'm going ? Two explanations come to mind : I may be blind and Robin also, or – and this is the most likely scenario – I had long greet some adorably hysterical children on one side of the road while Robin, exactly opposite to that time, chose his cold tea before turning one second after I disappeared into his back. Oh heck, enough thought for today, my brain too overheated, anyway. Place this beautiful descent and these fifty kilometers that await me, and that I will perform stuck behind the wheel to Robin if possible not to lose before the end of our day's stage, Oudomxay ! engineer 26, I am not only passionate about watts and technology. Writing, music, travel and sushi are among the things that speak to me, among others. Do you implement each a transmitter microchip! Even James Bond will track your adventures!